Charisma. Sarcasm. Entertainment. 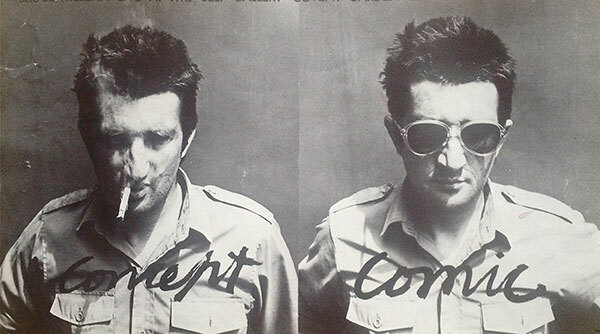 Bruce McLean in three words. Last week the Scottish artist inhabited the ICA studio as part of fig-2’s 50-week project in association with Outset. McLean assisted by Eddie Farrell (the kind of friend who is also like a brother) produced a conceptual film reflective of his position as an artist. This simply involved McLean interviewing himself, he proposed questions as if talking to the audience but answered them solely in a continuous one-person conversation. The audience laughs at his profound statement and the interview develops further with questions on where art is going, the concept of conceptual art and queries on the gallery space. I think these are continuous concerns of the art world today, yet with McLean you experience something new. The artist’s humorous expressions and hilarious wit had the whole audience completely immersed throughout. The evening was whimsical but reflective, satirical but thoughtful, but what made McLean’s concept so powerful was witnessing something purely genuine. The friendship between McLean and Farrell and the artist’s honest words were a pleasure to experience. McLean’s performance took place in many stages throughout the evening and simply consisted of two chairs, two pairs of glasses, one mirror, one table, one camera and two entertaining chaps. Farrell filmed McLean as he posed questions to himself, answering them in his reflection in the mirror as well as swapping glasses and seats (well attempting to!). Watching this certainly gave the audience a laugh, but once McLean was in full swing the room fell silent and only his truthful, inspiring words echoed in the space. McLean doesn’t want the final film to look as he has imagined, as what is the point? I hope the final piece exceeded what the artist had imagined; it could have only got better after Monday’s beginning moments. Posted in art and tagged art, art commentary, Bruce McLean, contemporary art, performance. Bookmark the permalink.